A workshop on fluorescence microscopy will be held next Friday May 5th in Aula DINI at SNS. Please, find HERE the LINK to the program. Write a mail to Prof. Stefano Luin to confirm your participation. 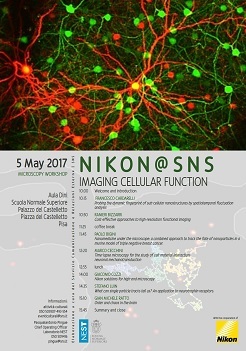 Il prossimo VENERDI’ 5 MAGGIO ci sarà in AULA DINI un workshop congiunto NEST-NIKON sulla microscopia a fluorescenza avanzata!